Whether you like to swim in a lake or like your water hot or cold, there is something for everyone. Dive off your boat or wade in from the shore. Georgetown Lake is shallow so it warms quickly in the summer. Put on some fins and a mask and spot some of those monster trout. 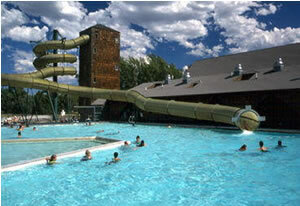 For the more faint of heart, try the public pools at Washoe Park in Anaconda. See Washoe Park for more information. Fairmont Hot Springs has a warm water pool with a waterslide.